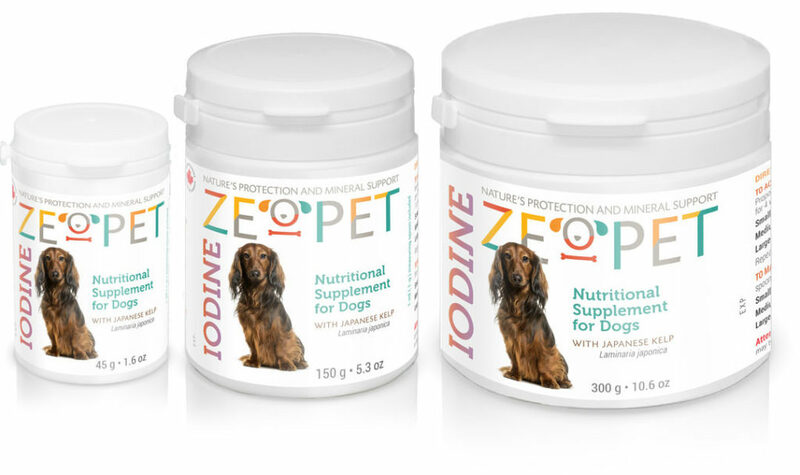 ZeoPet Iodine is a complex nutritional supplement for pets with zeolite and seaweeds, made of a special grind for dogs of different breeds. ZeoPet Iodine is produced from natural, high-quality zeolite mineral in a special spatial configuration – clinoptilolite – and processed seaweeds (Japanese kelp / Laminaria japonica). ZeoPet Iodine is an effective natural sorbent (cleaner), ion exchanger, and source of biologically active essential substances, microelements, and special pigments. When ZeoPet Iodine enters the animal’s digestive tract, it improves the excretion process of dangerous low-molecular pollutants and toxins; as well as normalizes, enriches, and restores mineral metabolism. By adsorbing heavy metals, radionuclides, inorganic toxins, and wastes of various origins, zeolite provides the animal’s body with essential microelements and valuable mineral components. The seaweed components (Laminaria japonica) of ZeoPet Iodine actively assist the restoration of metabolism and normalization of thyroid function. In addition, the seaweeds’ biologically active components (protein and minerals) support the development and restoration of bone tissue, strengthen the immune system, and improve the animal’s exterior (fur quality). Mix into dog’s food immediately before feeding. Repeat following a two-week break if desired. 45% Seaweed (Japanese kelp – Laminaria japonica). No chemical additives, dyes, or fillings.